Dr. Mahapatra is well versed in Yoga, Tantra and Astrology and has got the credit to publish seventy articles in the different national and state journals which brought him state and national repute in recognition. His valuable books. With the advent of British Regime to the land of Orissa, there started proselytizing and reforming activities by the Christian missionaries which led to the significant change in woman's social condition, emergence of a native intelligentsia, formation of socio-political associations, socio-religious reform movements and growth of a few urban centers and elimination of rigidity in the caste system. Even these changes were reflected on the contemporary official periodicals, Oriya newspapers and periodicals, Oriya literature and accounts of the Missionaries. Although some of the predecessors have made attempts to throw light on the social changes under the British Crown in the 19th century but none has made a holistic study of the various aspects of the social life of the then people. 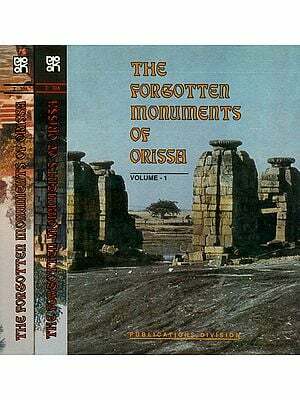 Hence an humble approach has been made in this treatise to highlight the social history of Orissa in the 19th century. 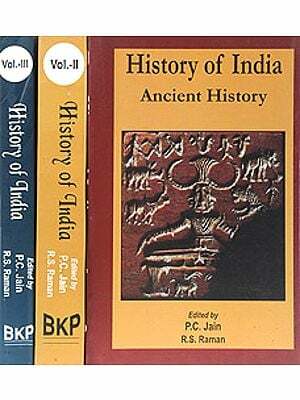 This book will be of immense help to the scholars of modem Indian History as it contains the historical background, development of the educational system, growth of printing press and news papers, emergence of associations, spread of religious cults and the change of social structure which culminate in the rapid growth of modernization through the evolution of social consciousness. The rise and expansion of British rule in India not only resulted in the establishment of new political and administrative institutions in place of the indigenous ones but also in the introduction of important and far-reaching changes in the social life of the people. 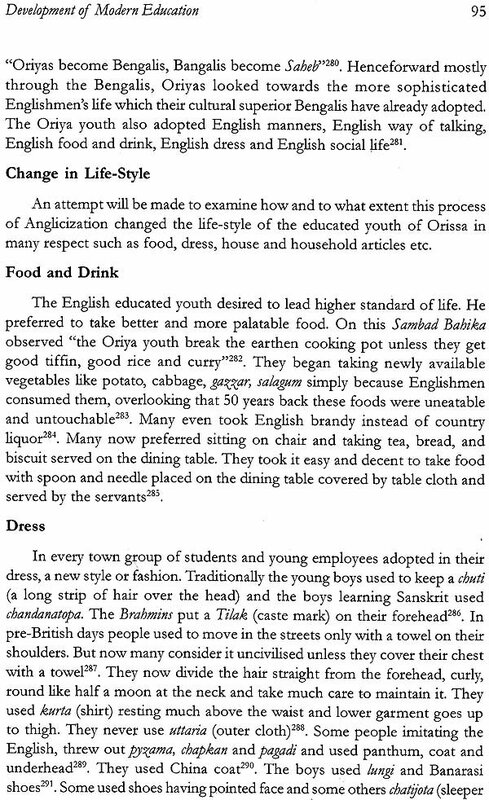 While British authorities enforced certain social reforms like the abolition of Sati, female infanticide and Mariah (human sacrifice) through drastic legislative and administrative action, other social changes such as the growth of education and press and rise of a new intelligentsia took place gradually through the evolution of social consciousness due to the impact of British rule in the land of Orissa. Orissa came under the British rule in 1803. 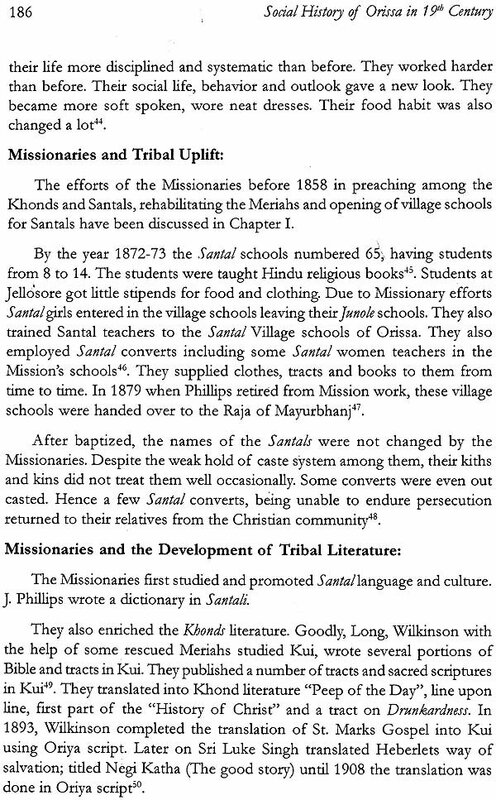 Within a short time thereafter the Christian Missionaries came to Orissa and started their proselytizing and reforming activities. 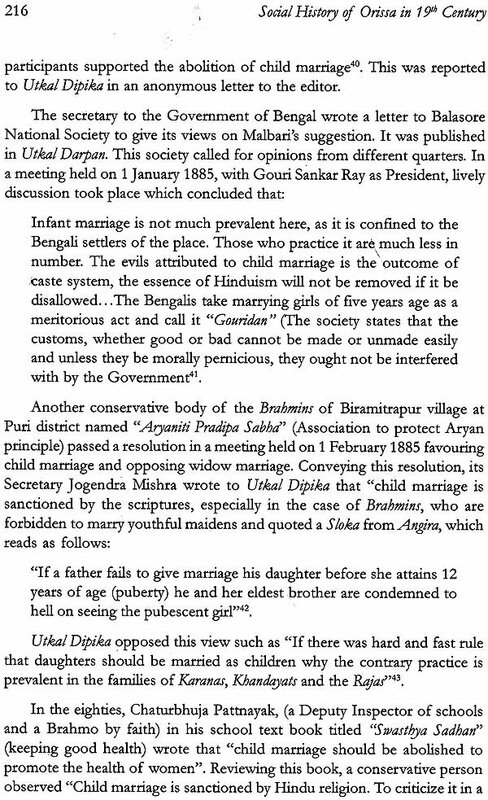 The abolition of Sati in 1829 had its impact on Orissa. In the mid-nineteenth century the practice of human sacrifice, called Meriah sacrifice was suppressed by the British authorities. In the latter half of the nineteenth century profound and far-reaching social changes such as the growth of modern education and press which had already been introduced earlier, slow but significant change in women's social condition, emergence of a native intelligentsia, formation of socio-political associations, socio-religious reform movements, growth of a few urban centers and the gradual slackening of caste system became visible. Considerable amount of data about these social changes were made available in contemporary official records, Oriya newspapers and periodicals, Oriya literature and accounts of the Missionaries and other observers. 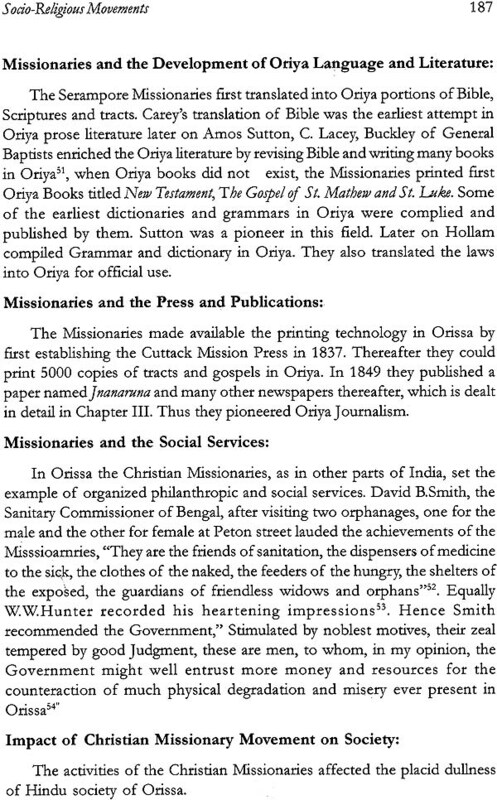 Little information on the social life of Orissa during the nineteenth century available in James Pegg's A History of the General Baptist Mission, London, 1846, India's Cry to British Humanity, London,1830, Amos Sutton's Orissa and its Evangelization, London, 1850, Narrative of the Rise and Progress of the Mission at Orissa, London, 1833, WF.B. Laurie's, Orissa: The Garden of Superstition and Idolatry, London, 1850, G.Toynbee's A Sketch of the History of Orissa, 1830- 1828, Calcutta, 1873, Andrew Sterling's An Account(Geographical, Statistical and Historical) of Orissa, Vol I and II, London, 1872 is also utilized to prepare this treatise. Scholars working on modern Orissan history, in their learned works (B.C. Ray, Foundations if British Orissa, Cuttack, 1960, Pravat Mukharjee's History if Orissa, in Nineteenth century, Vol VI, Bhubaneswar, 1964, K.M. Patro's Orissa under East India Company, New Delhi, 1971, J.K. Samal's Orissa under the British crown, 1858-1905, New Delhi 1977, Jaganath Pattnayak's Feudatory states if Orissa, Volume I and II, Allahabad, 1988, Dr. J.K Dwivedy's British Educational policy in Orissa, 1803-1936 unpublished thesis, Bhubaneswar, 1982, Dasarathi Sworo's The Christian Missionaries in Orissa: Their Impact in Nineteenth Century Society, Calcutta, 1990 and Nihar Ranjan Pattnayak's Glimpse into the social History if Nineteenth Century Orissa, Allabhad, 1989) have partially utilized the available source material to throw light on some aspects of Orissa's social life during nineteenth century. Prof. B.C. 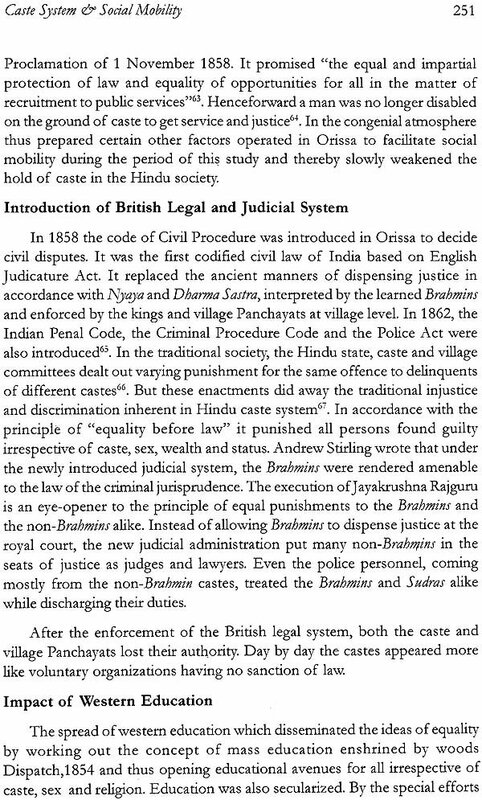 Roy's book Foundations if British Orissa primarily discusses the problems that the Britishers faced while occupying Orissa (1803) and devising a satisfactory administrative system in Orissa in early nineteenth century. 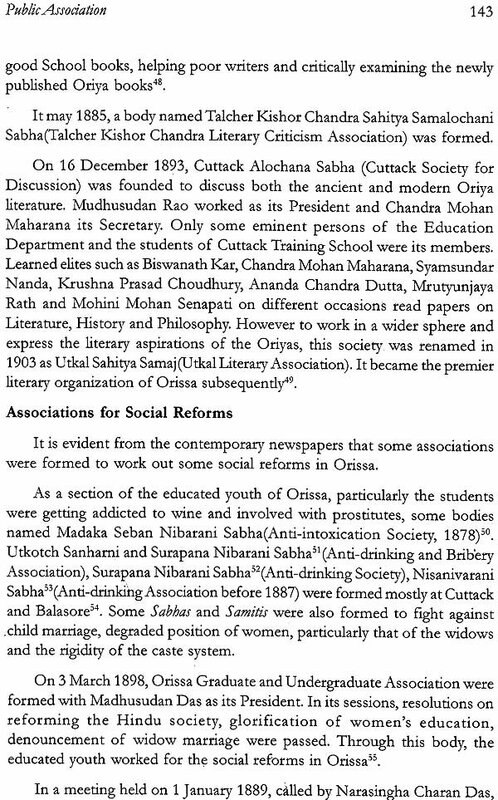 Prof. Pravat Mukherjee's History if Orissa in the nineteenth century is a general study of almost all the aspects of the History of Modern Orissa, although it gives a short sketch on the Development of Education, employment, abolition of Sati, Meriah and infanticide. Prof. K.M. Patro's Orissa under the East India Compa1!J dwells upon some important aspects of British Administration in both Orissa Division and Tributary Mahals during 1803-1857. However this book gives a short sketch of missionary activities at Puri. 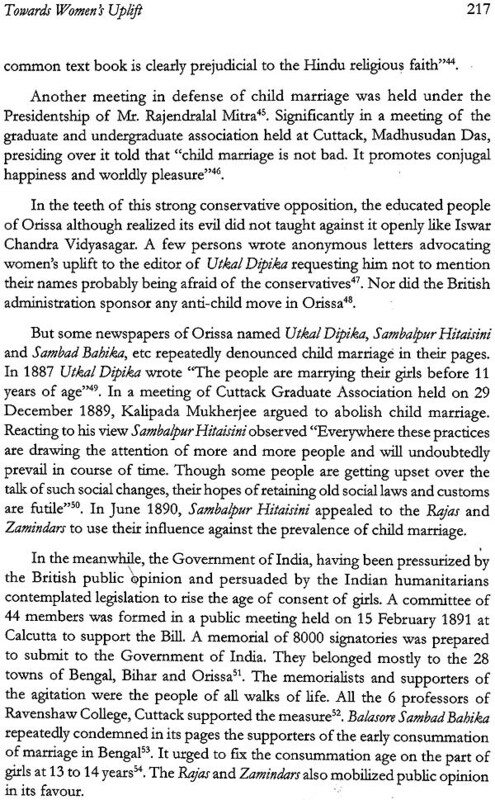 Prof. J.K. Samal's Orissa under the British Crown discuses only the administrative History of Orissa during 1858-1905 although chapter VII of this book deals with Education in Orissa. 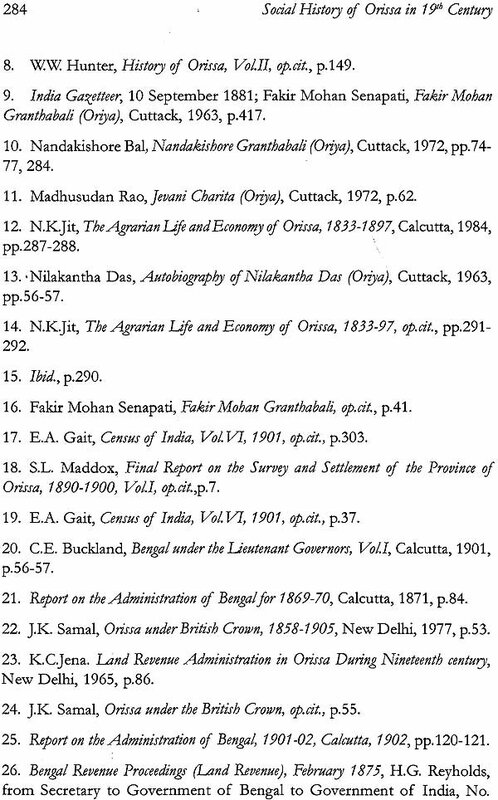 Prof. Jaganath Pattnayk's Feudatory States if Orissa, Vol. I as well as II discusses mostly its administrative History during 1803-1857. However in volume II of this book, a chapter is exclusively devoted to the social condition in the Feudatory states of Orissa. 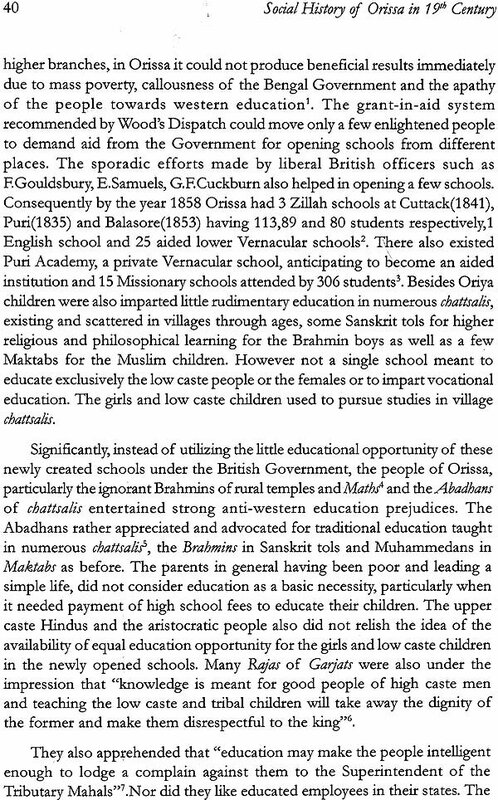 Dr. J.K. Dwivedy's British Educational Policy in Orissa, 1803-1936, although elaborates the spread of education in Orissa, but it does not discuss on the Growth of indigenous education in Orissa and the educational development in the Feudatory States. 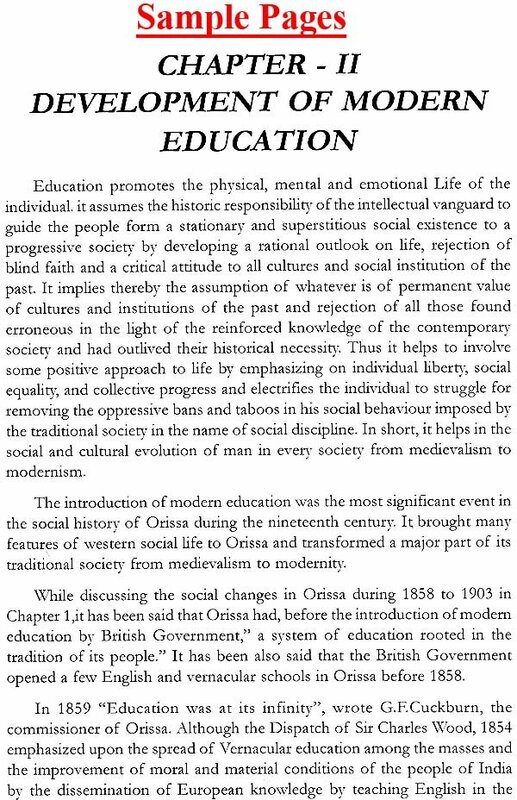 Nor it says anything on the impact of Education on Orissan society during nineteenth century. Dasarathi Sworo's The Christian Missionaries in Orissa: Their impact in Nineteenth century society narrates the spread of Christianity in Orissa, but does not critically examine its impact on the Oriya society. While most of these works deal with political and administrative aspects, Nihar Ranjan Pattnayak's A Glimpse into the social History of Nineteenth Century Orissa exclusively deals with some important social reforms like the abolition of sati, female infanticide and Meriah sacrifice. But this work does not present an overall picture of the social life of Orissa during nineteenth century. Basing mostly on primary source materials, the present work attempts to identify and measure the prominent changes in many important aspects of the social life of Orissa (comprising North Orissa division and 17 feudatory states) in the nineteenth century. The year 1858 has been taken as the starting point of this work, not simply because of the transfer of power from company to crown, but because of the fact that perceptible social changes began taking place in the latter half of the nineteenth century. This study ends with the year 1903 which saw the formation of the Utkal union conference as a natural culmination of the socio-political consciousness of the nineteenth century Orissa. The present treatise is comprised of nine' chapters for the holistic study. The introductory Chapter discusses the historical background of Orissa during 1803-1857; the social changes introduced on Orissa during the company's period along with the present structure of the nineteenth century society in Orissa. Chapter II describes the development of the modern educational system in Orissa and its social impart. 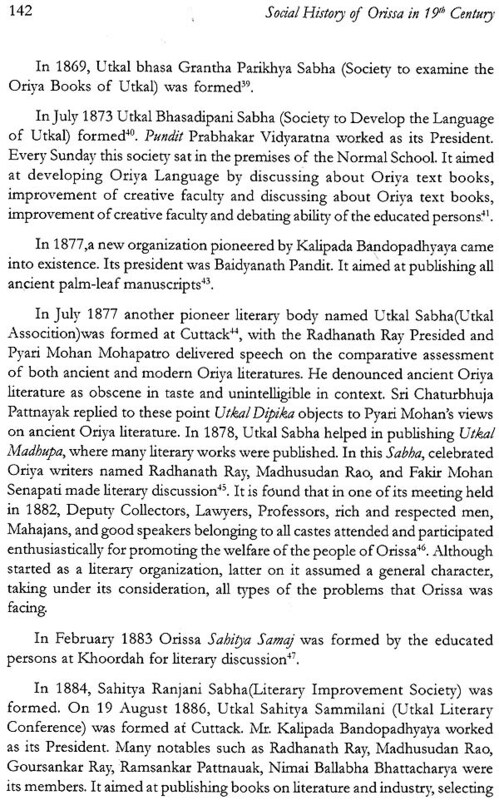 Chapter III traces the origin and development of printing press and publication of newspapers and periodicals which worked as the principal agency to arouse the social and political consciousness of the people of Orissa. Chapter IV deals with the mushrooming of association, clubs, libraries etc and the emergence of public life in Orissa during the period of this study. Chapter V discusses the growth of some urban centers in Orissa along with the factors which promoted such growth and hindered the pace of rapid urbanization in Orissa. Chapter VI discusses on the spread of Christianity, Brahmo faith and Mahima cult in Orissa with all their enlightening and reforming effects on the traditional socio-religious life. Chapter VII discusses how and to what extent the women in Orissa were freed from the traditional social disabilities and made educational advancement. 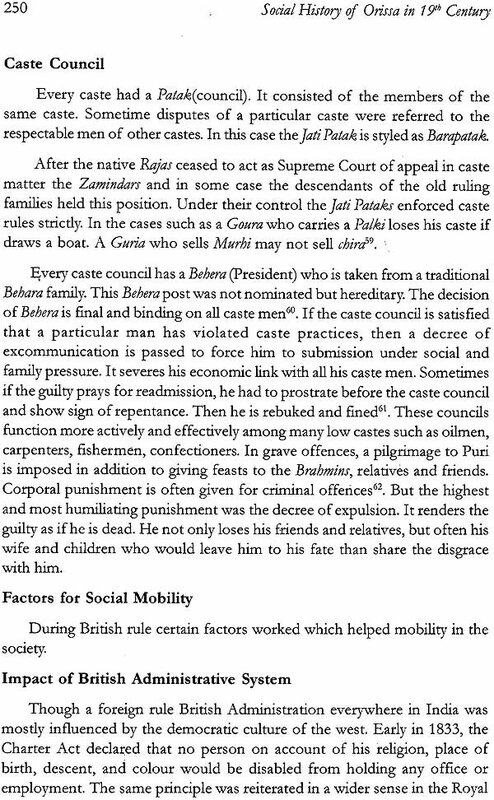 Chapter VIII presents here the traditional caste system and structure and discusses how it was gradually slackened under the impact of the newly emerging forces of social mobility. The conclusion briefly resumes the entire study, points out the role of the elites and identifies some real changes in the social and general economic life of Orissa until the year 1903. Orissa was conquered by the British in the year 1803. Thereafter it was tagged to Bengal presidency as an administrative appendage as well as a territorial bridge between Bengal and Madras. Without paying special attention to its remoteness, inaccessibility and general backwardness as it came late under the British rule, only one collector was placed for the entire Orissa Division who was told "to get as much and spend as little as he possibly could'". While in many other parts of India during the Company's period the administrative machinery was elaborated and improved, minimum attention was paid to the administrative arrangement in Orissa. Much late in 1818, a Commissioner was appointed for Orissa Division. Long after that in the year 1828 Orissa was divided into three natural districts. Presuming that the number of officers employed in Orissa was more than what it should be in proportion to its revenue and population, the strength of the officers was reduced from 9 to 7 on 23rd October 1828. These seven officers consisted of the Commissioner, the Civil Judge and the Magistrate of the Central Division and his assistant of superior class, an officer for Balasore district to work as collector, Salt Agent, Magistrate, customs officers and the Registrar of the civil Court, another officer at Puri to work as its Collector, Salt Agent, Magistrate and also collection of pilgrim tax and other officer at Cuttack to work as Collector and Salt Agent with a Deputy Collector to assist him. The works and responsibilities of the commissioner were further increased by instructing him, as per the Regulation I of 1829, to function as the Board of Revenue and Court of Wards for Orissa under the Sadder Board of Revenue at Calcutta. Likewise the Collectors works were also increased by entrusting them with the short term settlement work of the early nineteenth century" To establish control over the Rajas of the Garajats, a superintendent of the Tributary Mahalas was appointed in 1814 along with an assistant of superior grade. The natives were considered unaware of the administration in general, particularly the new English methods of revenue accounts. The traditional officials recruited from the Brahmins and more particularly the Sasani Brahmins also could not be employed for their suspicious allegiance. Hence the subordinate staffs were recruited from the neighbouring regions, comprising mostly of the Bengalis, who were ignorant of the people of Orissa, their language and their ways of workings. Once in office, they practically guided the few British officers and filled the vacant posts with their kith and kin. This wholesale exclusion of the Oriyas from all offices of trust and responsibility tended to check the diffusion of the knowledge of the British administrative system to a great extents. On the eve of British occupation, vast tracts of land in Orissa lay uncultivated. Floods and droughts occurred frequently. Land itself had not much value. The landholders had to request, encourage and in certain cases compel cultivators to cultivate land. The population distribution in Orissa was uneven and the general public was immobile. Only Pahi raiyats, who constituted 63% of the tenants of Orissa were moving to different places to cultivate the land and thereby brought a balance between the land and the cultivation. No intermediary agencies like the Zamidars claiming exclusive ownership of the land did exist in pre-Mughal days. Although in the official records of the Maratha Government the title of Zamidars was given only to a few holders of one or more Parganas and the Rajas of Killas, in common language the titles of Talukdars and Zamindars were used as synonymous. 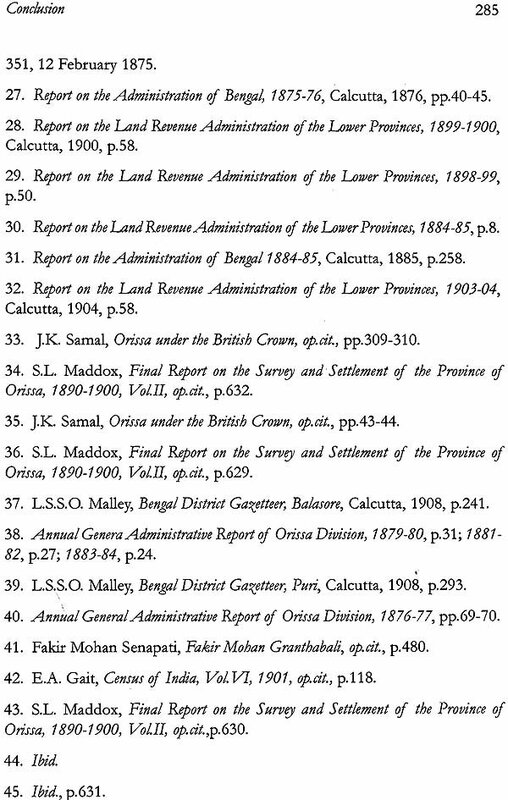 As the Board of Revenue of Calcutta directed the officials of Orissa to engage with the Zamindars or "other actual proprietors of the soil" in accordance with the Bengal pattern, all those who had previously possessed only a hereditary right of collection in lieu of getting rent-free lands titled as Jagirdar, Makadam, Sarbarakar, Khandadar and Talukdar including the classes of Sadar Kanungoes were taken as "Malikani Jamin" or proprietors of the land and thus constituted a class of Zamindar!. It even included all those classes of persons collecting the revenue, who assumed the title of Zamindars on their own during the contusion which prevailed in Orissa between 1801 and British occupation in 1803.The settlement of 1837-45 also recognised a class of subordinate proprietors on proprietary tenure-holders consisting of villager headman and minor revenue officials or purchasers or recipients of proprietary right in small plots of land for the Zamindars or Mukaddams. While the Zamindars paid their revenue demand direct to the treasury, these sub-proprietors paid through the Zamindars within whose estates their lands lay'". A right which never existed in Orissa was silently acquired in and indirectly admitted and continued by the Regulation 12 of 1805 and other Regulations. G.Toynbee rightly remarked, "The collectors trained in Bengal, not finding in Orissa any person corresponding to the Zamindars of that province manufactured him out of the material which they found most ready at hand. The British Government also gave a new deal to the traditional native posts. Soon of conquest, the post of Gomasta was abolished. In estates having a Jumma of above rupees 500.00, the Putwaris were given land grants and in smaller estates the Zamindars were asked to appoint them as accountant, which the former did not comply. The post of Kanungo was abolished in 1828.The Dalais and Dalbeheras were given some police power on conditioned land grants who used to terrorise the cultivators. The Sarbarkars who used to render military and non-military services were invited to be revenue officers on commissions basis and were divided into Maurasi (hereditary) and Miadi (for fixed time) Sarbarakars. As the people used to mistrust the governing authority, the British, after their occupation, could not obtain any revenue documents from the native officials except some Jamanbandi paper or records of raiyat: assessments made over by the chief Kanungo of the Maratha Government. The Maratha Amils, Sardar Kanungoes, Talukdars, Makadams were all intent on not disclosing but preserving for their own use the information which should have been in the hands of the Government. Hence no knowledge was gained about the rights and titles of various revenue collecting native officials, It was in 1821, Andrew Stirling dealt exhaustively on this subject and not until the settlement of 1837 -45 the question of rights and titles were finally settled and adjusted. Until 1837, the Government did not follow any settled land revenue policy in Orissa. It made 11 short time settlements, 4 annual, 1 biennial, and 4 triennial, 1 penitential and 1 decennial settlement and increased the demand in every settlements. This policy of experimenting short-term settlements intended to be preparatory to a permanent one of constantly indulging proprietors with hopes that were never to be gratified proved to be most ruinous in their effects. All the Zamindars became interested in concealing their collections and throwing the lands out of cultivation to get better terms at the permanent settlement mooted in 1806. And the tenants, being forced to pay more and more in shape of rents, awabs, cesses and Salamies by the Zamindars, Dalais and Dalabeheras, Makadams and Sarbarkars did neither feel secure nor Permanency in their profits.